Rebecca is the second novel which turned me into an avid reader, and contributed to build the writer I am. Three protagonists; a plain nameless heroine, always in enigmatic, deceased Rebecca’s shadow, and an ambiguous hero, Max, who is both an ideal lover and a short-tempered, disturbed husband, make up the novel. However, there is a fourth character: Manderlay, the house where the three weave an intense and unforgettable story, which inevitably reminds us of Jane Eyre, the first book which made me the reader and writer I am. ‘Last night I dreamt I went to Manderlay again…‘ are the unforgettable first lines to this spellbinding, classic novel, which draws us into the narrative right from the first word. The narrator is revisiting her home after its complete devastation, yet ‘Time could not wreck the perfect symmetry of those walls, nor the site itself, a jewel in the hollow of a hand.‘ It reminds me of Jane Eyre’s desperate return to Thornfield Hall, searching for her beloved Rochester, after hearing him call her in her across the moors. Jane was shocked to find ‘a blackened ruin.’ Later she saw the empty shell, ‘wandering round the shattered walls and through the devastated interior’. 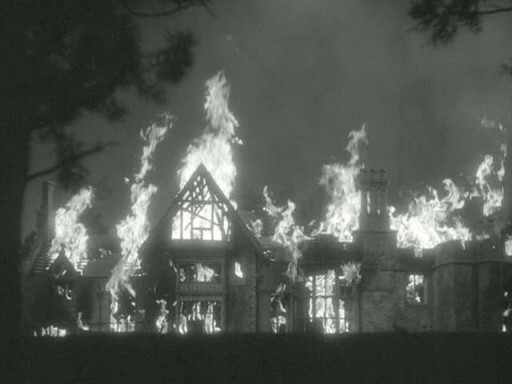 Manderlay and Thornfield both burnt down so that the second Mrs. Rochester and the second Mrs. de Winter could start again with their beloved, Edward and Max, respectively. Both fires burnt down the memories and physical representations of their husbands’ first wives: Bertha and Rebecca… But that will be the subject of another, literary entry. The rest of this post must be devoted to Rebecca. The novel is told as a flashback. The nameless heroine and her husband, Max, are living in Europe, traveling from hotel to hotel, harboring memories of a beautiful home called Manderley. They are recovering from a great trauma which occurred as a result of the burning of Manderlay. Max’s wife, then tells the story of how they met in Monte Carlo, where she was working as a travel companion to a rich and snobbish lady. She describes herself in this way, ‘I can see myself now, memory spanning the years like a bridge, with straight, bobbed hair and youthful, unpowdered face, dressed in an ill-fitting coat and skirt and a jumper of my own creation, trailing in the wake of Mrs. Van Hopper like a shy, uneasy colt.’ Max unexpectedly proposed and her life changed completely. When she arrived to Manderlay after their European honeymoon, she met the sinister Mrs. Danvers, housekeeper and Rebecca’s standard-bearer, ‘Someone advanced from the sea of faces, someone tall and gaunt, dressed in deep black, whose prominent cheek-bones and great, hollow eyes gave her a skull’s face, parchment-white, set on a skeleton’s frame.‘ She was there to remind her that she would never feel at home in Manderlay, because she would never be good enough. Or perhaps Mrs. Danvers is there to claim vengeance for Rebecca’s cold-blooded murder…? The story takes another unexpected turn when the wreckage of Rebecca’s sailboat is found with Rebecca’s dead body in the hold. As a result, Max tells his wife that he didn’t love Rebecca, whom he describes as a malevolent person who had secret lovers, including her cousin, Jack Favell, ‘Our marriage was a farce from the very first. She was vicious, damnable, rotten through and through. We never loved each other, never had one moment of happiness together.’ On the night of her death, Maxim had demanded a divorce, and she had refused telling him she was pregnant with Favell’s child. As a result he tells his present wife, ‘I shot Rebecca in the cottage in the cove. I carried her body to the cabin, and took the boat out that night and sunk it there, where they found it today.’ This shocking confession is well-received by his wife, who is relieved that it means that there is still hope for their marriage. Luckily, and due to his influence in local society, the coroner delivers a report of suicide, rather than murder, and his friend, the local magistrate, Colonel Julyan, rules her death as suicide because he discovers that Rebecca was dying of cancer. Max and his young bride conveniently convince themselves that Rebecca had provoked Max into killing her, because she wanted to die, and was unable to commit suicide herself. We have a flawed hero and a collaborating heroine, who both destroy the first wife whom they consider an obstacle to their happiness and peace of mind. But Rebecca has a bittersweet ending. I believe Du Maurier is convinced that they have both behaved illicitly, and although they will not pay for their crime legally, they will pay for it morally by never finding happiness together. As so often happens with great works of art, a rereading between the lines reveals another, unwritten story. Rebecca’s real story: the story of the ailing woman who was killed by her murderous husband, whose ghost will not allow him to be happy. The reader senses Max and the narrator will never find peace or enjoy a happy marriage after what has happened. They are both too flawed. Similarly, Jane Eyre and Mr. Rochester will not find peace after their treatment of Bertha Mason, whose presence will haunt them right into the 21st century and my novel All Hallows at Eyre Hall. The power of this novel is the narrator’s ability to purposefully manipulate readers and convince them that Rebecca’s murder was justified, and that the murderers where innocent. In the same way that readers are convinced that Edward Rochester was a ‘good’ husband to the ‘wicked’ and ‘insane’ Bertha Mason. Readers see Max and Rochester in the eyes of women in love with them, but I am convinced both writers knew they were manipulating readers, while telling another story: Rebecca and Bertha’s implicit story. Finally, it is not always that a film pays a just tribute to a novel, fortunately. this is the case with Rebecca. Hitchcock’s film is magnificent and brings accross faithfully, the tormented characters, and the surprising climax. Brilliantly directed and superbly interpreted. I never tire of watching it.